ELUTENG 5.25 Front Panel with 2 port USB3.0 and 2 port USB2.0, fit PC case with free 5.25 inch CD-ROM. With 20 pin USB 3.0 and 9Pin USB2.0 connector***make sure your PC has free 20 Pin USB 3.0 and 9Pin USB2.0 male port. 3. Up to 5Gbps, equipped with 15pin to 4 pin SATA power cable, 20pin to USB 3.0 female cable and 10Pin Tin-coated copper wire. 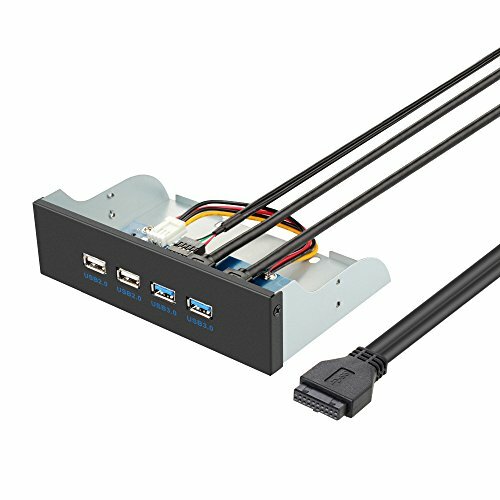 This floppy Adapter for 5.25 Bay, support 4 USB devices working simultaneously, and compatible with USB1.1. Made of aluminum alloy, equipped with 8 screws and intelligent chip, plug and play, support hot swapp.